Yesterday Jaguar unveiled the exciting 2019 Jaguar I-PACE. This luxury performance SUV is Jaguar‘s first battery electric vehicle (BEV). It features a 90 kWh battery that gets an estimated range of up to 240 miles on a charge. That power goes to twin motors that provide a combined 394 hp and 512 lb-ft of torque. This impressive power allows the I-PACE to deliver the ability to go from 0 – 60 mph in 4.5 seconds! Charging the I-PACE isn’t difficult either. Use the fast charger to charge from zero to 80 percent in only 40 minutes. Or use a 230V AC wall box to charge the vehicle to 80% in just over 10 hours. The Jaguar I-PACE SUV will deliver the driving performance and luxury you expect from a Jaguar. All I-PACE models come with standard all-wheel drive for optimal performance in a variety of road and weather conditions. Other exciting features include Jaguar InControl® Touch Pro Duo™ infotainment system with a 10-inch upper and 5.5-inch lower touchscreen configuration. Us the Amazon Alexa Skill feature to audibly access a variety of information from the Jaguar InControl Romote app using your Alexa-enabled device. 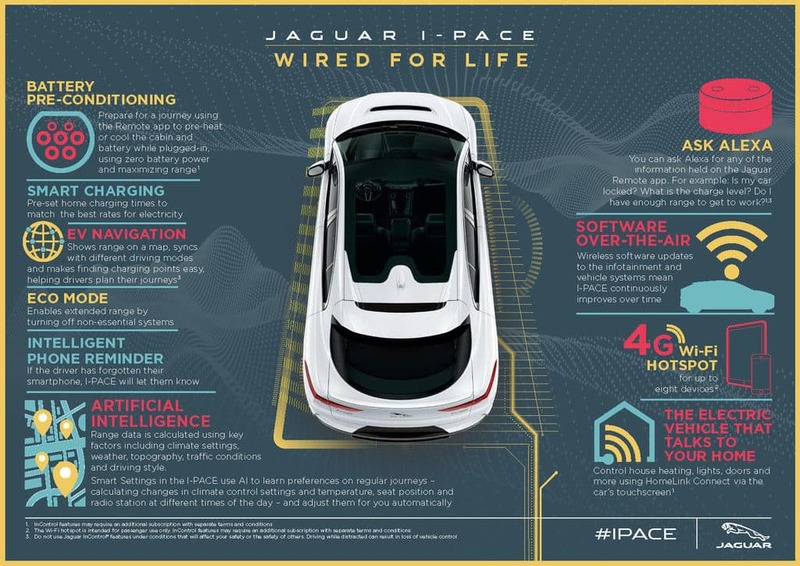 In addition, the I-PACE will be the first Jaguar to have Software-Over-the-Air (SOTA) capability. That means customers can update vehicle systems wirelessly. The 2019 Jaguar I-PACE will be available in three trim levels — the S, SE, and HSE. There will also be a First Edition model available for the first year. The I-PACE is expected at our dealership a little later in 2018. So, you don’t have long to wait to be able to buy this exciting and capable all-electric SUV! Contact Jaguar Colorado Springs for more information or to order yours today!